The project began with a quest to answer a seemingly impossible question: can a tilting mechanism be found for a FWD delta trike that will improve cornering speed, eliminate shimmy and also be self-centering? The only way I managed to find a solution was by spending countless hours doing CAD simulations. I am a advocate for open source software, so in keeping with that philosophy I have published the Jetrike plans as an open design. All I ask is that if you build something with them or improve the design in any way, email me a photo so I can share your contribution with others. You can download the pdf plans here. Get involved, join the Jetalk mailing list. The Jetrike plans are A4 sized and available in PDF format, so you can easily download and print them. The rear self-centering tilt geometry is very exacting, so a detailed explanation is in order. Here you will find a weekly diary and photo essay on the trails and tribulations of my Jetrike's construction. 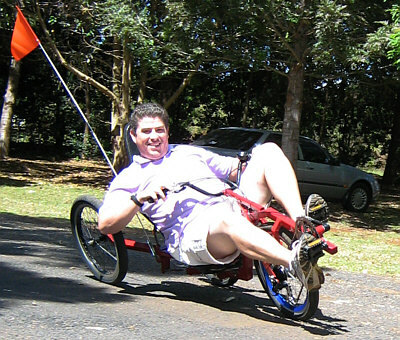 While the Jetrike self-centering geometry is unique, the rear tilting mechanism was actually invented in 1987 by Curtis L. Prince.